The Duchess of Cambridge Jewellery part 2 can be found here. The discussion about the replica engagement rings has been move here: Royal Replicas. I love the Cambridge and the Lotus tiaras. I dislike her wedding tiara. I can't wait to see other tiaras she will wear in the incoming years and when she is Queen. It is amazing that the Duchess of Cambridge has already worn 3 different tiaras in only 4 different occasions. I can't imagine that she will wear other tiaras any time soon, because that is not the way things are done in the BRF. But I do think that the spell is no broken, so to speak, and that the Cambridges will now attend State Banquets on a more regular basis. I'd love to see the wedding tiara again. In a nice up-do and without that very dense veil it would looke lovely, imo. And of course I'd like to see Queen Mary's lovers knot tiara probperly on her, not like in those car pics. That must be another stunning sight. All in all I love diversity, so I hope that Kate will rotate her tiara on a regular basis, so that we can appreaciate the variety of them. Very close pic of Kate's citrine earrings (with the watermark on the top part ). But one can even appreciat the cut of the stone. One pays for the quality of the stone and the craftsmanship. The stone is supposed to reflect light on to the face. These Citrine earrings are obviously a favourite of The DOC's. Thanks for the close up!! I believe that The DOC is wearing quite a few pieces of The late Princess of Wales and Queen Mothers jewellery and that that trend will continue. 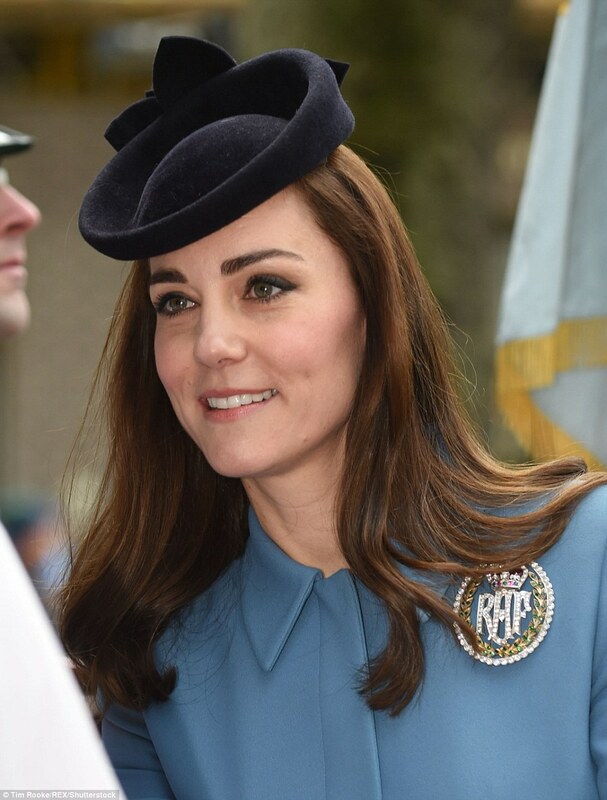 The Duchess of Cambridge, Honorary Air Commandant, joined members of the RAF Air Cadets to mark their 75th anniversary for her first official engagement of the year. She wore an Air Cadets Dacre brooch, known to be the highest award any female cadet can achieve. The brooch can hardly be seen, the hair should have been up!! There are plenty of clear pictures of her wearing the brooch. Very nice indeed. Yes, when the hair was flipped back. Lots of pictures with brooch covered. haha! that might be nice to get the highest award without doing any military training! just because you are a princess! the perks of being royal! Is it the award brooch or a copy? It will be interesting to know. The brooch USED to be given to the best female cadet. They retired the brooch in favor of giving the best female cadet a sword just like the males. Presumably, the Air Cadets decided to give the brooch to the Duchess of Cambridge as their new Commandant as honestly it would never get worn otherwise. I like they decided to give Catherine the brooch. It's very impressive and it must dazzle if worn at night too.